We are ranked amongst the renowned organizations that are engaged to provide the best quality range of DOL Motor Starter. Offered motor starter is manufactured using quality assured electrical components, raw material and superior technology in synchronization with the set industry standards. Our skilled professionals provide this motor starter in various models as per the demands of our clients. Apart from this, the provided motor starter can be availed by our clients at budget friendly price. 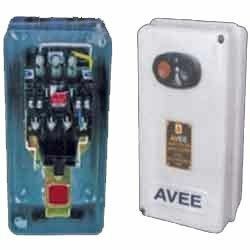 Established in the year 1987, in Ahmedabad (Gujarat, India), we “Avee Electro Controls (India)” reputed organization engaged in manufacturing, trading and supplying a comprehensive array of Submersible Pump Control Panel, Electrical Wire And Cable, Star Delta Motor Starter, APFC Control Panel, Electrical Spare Part, DOL Motor Starter, Power Capacitor, Power Contactor, Over Load Relay, Fuse Link, Auto Switch, Circuit Breaker, Chain Sprocket, Distribution Board, Liquid Level Controller, etc. The offered products are manufactured using quality tested raw material and sophisticated technology as per the set industry standard norms. We strictly test the offered range on several quality parameters to ensure its quality. Also, we provide this range in a high quality packaging material to ensure safe delivery at user's end. Being a customer-centric firm, we have been able to provide maximum satisfaction to clients by providing them a high quality range of products within the promised time frame. We are offering some well-known brands like AVEE, Havells, L&T, Siemense, BCH, Schinder, Peco (PCI), Ellico, Jainflex, C&S, Electra, Selectron,Pla Relay, Teknik, Glostar, Sony Gold, Emtech, KEW, GE Switchgear, ABB, Polycab, RR Cable, Finolex, Steel Grip, etc.